GETTING THERE FROM HERE-One of the consequences of our longstanding political conundrum is that we face a two-party system that offers taxpaying voters a choice of two unsavory extremes: Republican leadership that is all-too-unwilling to articulate a plan to fund and build a first-rate transportation/infrastructure system, and Democratic leadership that is all-too-unwilling to articulate a plan to fund and build a cost-effective transportation/infrastructure system. 1) The multi-year federal infrastructure bill that remains unfunded, and with gas tax revenues tapped out, are issues that traditionally can and should be used by Democrats to paint Republicans as obstructionist--not without some sympathy even from conservative voters. 2) Yet the choice that leading federal Democrats in 2008 had--an ill-conceived federal stimulus bill which had a poorly-defined, pork-laden approach that rewarded a few well-connected, well-heeled donors at the expense of a host of more defined and favored priorities (freeways, roads, passenger rail, sidewalks, alleys) is fresh in the minds of voters, and is likely to be perceived as a waste of a good opportunity by the Obama Administration. 3) In California, a weak and divided GOP led by Neel Kashkari--who correctly articulated the concerns of taxpayers about the funding of high-speed rail to the exclusion of numerous other road and water projects, but failed to come up with his own bold and daring plan--and Controller candidate and Fresno Mayor Ashley Swearengin (who ignored the sentiments of her party and favored the high-speed rail as is) lost to Jerry Brown, who successfully campaigned around them as irrelevant and focused on Propositions 1 and 2. 4) While Kashkari pulled off stunts like living like a homeless person in Fresno (Swearengin's turf) and divided the state GOP on numerous issues, Brown worked with both GOP and Democratic lawmakers to work on a bipartisan water bill (Proposition 1) and a budget-balancing bill (Proposition 2) that showed fiscal responsibility that marginalized traditionally-liberal voters who opposed dams and limits on spending. 5) Although Californian voters appeared to appoint Brown as the adult in Sacramento and vote him in for an unprecedented fourth gubernatorial term, they still voted in a Legislature that does not have the two-thirds majority to ignore GOP/conservative concerns and constituencies. 6) But the California High-Speed Rail issue will not go away as a thorny issue, because while Governor Brown opted to put so much money ($68 billion and climbing) for a project that is violating both the costs and promised speeds of the voter-approved bond initiative, it is to the EXCLUSION of other road and rail projects (including the popular MetroRail/LAX connection, or the long-pursued Wilshire Subway/Metro Purple Line). 7) Multimodal transportation is favored by an increasing number of cities, from liberal San Francisco to conservative San Diego--my old stomping grounds at UCSD is overdue but now outgoing in establishing a regional transportation plan. Yet paying for it in a cost-effective manner is also favored by voters throughout the political spectrum. 8) A GOP-dominated Congress will not willingly donate a red cent for California's High-Speed Rail Project, which is why California will have to "go it alone" on this and other transportation projects that have enjoyed substantial financial support from President Obama...and Californian voters will have to make difficult decisions at a time when unemployment is down--but yet well-paying career jobs are also historically low. 9) Transportation remains a priority, but concerns of traffic, and changes to neighborhoods that affect local character, quality of life and environmental safety also remains a priority to Californian voters. Building a large Millennium project on a state-recognized earthquake fault and overdeveloping in Malibu are concerns raised by the same voters who overwhelming supported more transportation/transit projects in 2008. 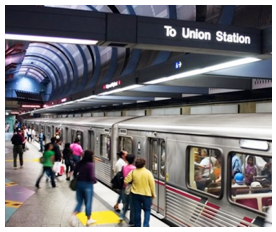 10) So while Westside voters anxiously await an Expo Line, and San Gabriel voters anxiously await a Foothill Gold Line, to open in 2016, and rail transit amenities await a host of improvements, the potential for a County Measure "R-2" in 2016 for more transportation sales taxes may fail. A County Measure R-2 may have the same fate in 2016 that the recently-failed County Measure P for more parks funding had in 2014--a good idea in theory, but poorly-defined and with too many potential unintended (and undesired) consequences for tapped-out and wary voters to approve by a 2/3 majority. In short, economic conservatism prevailed at the polls--and transportation funding may likely suffer as a consequence. Yet those who've been guilty of spending tax dollars without consideration of cost-effectiveness will--while they decry a lack of vision from GOP/conservative leadership--also need some self-reflection of their own unsavory operations as a result of last Tuesday's electoral sea change.